I asked some friends if grocery stores (supermarkets) are the same in every country. You already know the answer – NO. They are very different. Here are some things about American grocery stores that might be new, different, or strange for you. In most of the world, people use the metric system, but in the United States, we use the Imperial system. This system is confusing for everyone, but I hope I can help you understand a little bit today. I will tell you the word, and then I will put the abbreviation (short form) in parentheses. cup (c) – A cup measures liquids or solids. A cup of liquid is about 237 ml. In grams, it depends on the food. A cup of butter weighs about 227 grams. A cup of sugar weighs about 200 grams. A cup of flour weighs 136 grams. pound (lb) – A pound measures weight. A pound is 0.45 kg. The abbreviation for pound is “lb.” This comes from the Latin word for pound – libra. 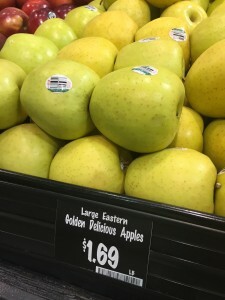 These apples cost $1.69/lb. That means one pound of apples costs $1.69. ounce (oz) – An ounce measures liquids or solids. An ounce is about 30 ml (liquids) or about 28 grams (solids). There are 8 ounces in 1 cup. pint (pt) – A pint measures liquid. There are 2 cups in 1 pint. A pint is 473 ml. quart (qt) – A quart measures liquid. A quart is 946 ml. A quart is 4 cups. gallon (gal) – A gallon measures liquid. One gallon is about 3.79 liters. One gallon is16 cups. One gallon is 8 pints. One gallon is 4 quarts. dozen (doz) – A dozen is 12. If you buy a dozen cupcakes, that’s 12 cupcakes. 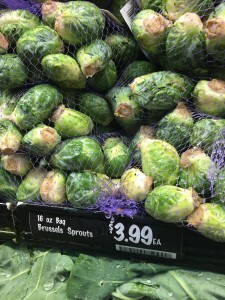 ea – This means “each.” The Brussels sprouts in the picture are in bags. One bag costs $3.99. The sign says they cost $3.99/ea. BOGO – This means “buy one, get one.” You might see a sign that says “BOGO 1/2 price.” That means when you pay full price for one, you can get another one for 1/2 price. American grocery stores are BIG. In many countries, the stores are small, and you go to different stores for different things. For example, you go to a bakery for your bread and cakes, and you go to a butcher for your meat. In the United States, you can get everything in one place. In the bakery section, you can buy bread, cakes, and other baked foods. In the deli section, you can get meats and cheeses cut fresh for you. You can buy as much or as little as you want. 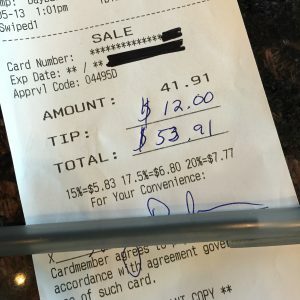 Just tell the person working there how much you want. In the produce section, you can buy fresh fruits and vegetables. In some countries, you need to weigh your produce and print a label before you go to the checkout counter. In the United States, you do not need to do this. You can take your produce to the checkout area, and the cashier will weigh it. There are scales in the produce department so you can get the exact amount that you want, but you do not need to weigh your fruits and vegetables if you don’t want to. In some countries, you pay for different things in different departments. In American grocery stores, you pay for everything at the checkout counter (at the front of the store). You do not pay for your bread in the bakery department, for example. In general, if a package is closed, or if several things are attached (held together), you must buy them like that. For example, if you see 6 bottles of Coke together (attached with plastic), you must buy all of them. You cannot buy only one. If you only want one small bottle of Coke, look in the refrigerator at the checkout counter. You CAN separate bananas if you don’t want to buy a bunch. Saving money on food is important to many people. Here are a few ways you can save money on groceries. Price Comparison – Prices are not standard, so the same thing might cost more or less depending on the store. Pay attention to the prices the next time you go to a grocery store, and then compare them to a different store’s prices. You might be surprised. 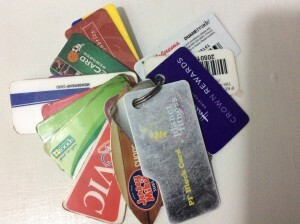 Rewards Cards – Most grocery stores have some kind of rewards card to help you save money at that store. Harris Teeter has the VIC card, Food Lion has the MVP card, and Kroger has the PLUS card. These cards are free, and you can use them every time you shop. If you use your card regularly, the store’s computer will give you coupons for the things you buy or similar things. Coupons – You can get coupons from the store, from inside a package, from the internet, or from the newspaper to save money on food. Just take your coupons with you when you shop, and give them to the cashier. Store Brands – There are two kinds of products: name brands and generic/store brands. Name brand products are more expensive because the company pays for advertising. Store brands are cheaper. 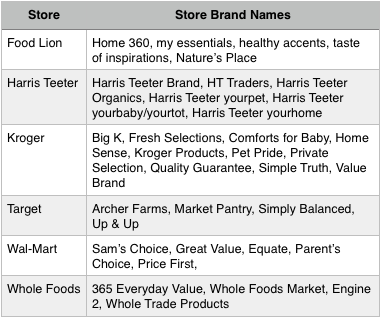 This chart will tell you the names of the store brands for several stores here in NC. The laws for buying and selling alcohol in the state of North Carolina might seem strange. You can buy alcohol Monday-Saturday from 7:00 am until 2:00 am. You can buy alcohol on Sunday from 12:00 noon until 2:00 am. 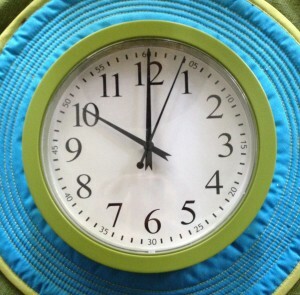 You cannot buy alcohol from 2:00 am until 7:00 am (or until noon on Sunday). If you want to buy wine for dinner on Sunday, you have to wait until the afternoon. Grocery stores do not sell liquor. They sell wine and beer, but if you want tequila, whiskey, vodka, or rum, you must go to the ABC store (alcoholic beverage control). You must be at least 21 years old to buy alcohol. 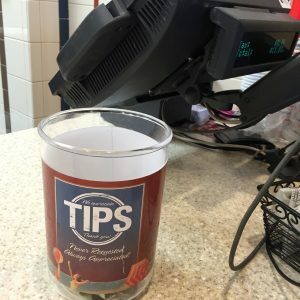 The cashier will ask to see your ID (driver’s license). If you do not have an ID for the cashier to check, you will not be allowed to buy alcohol. You cannot open your alcohol inside the store and begin drinking it. Every community has places to shop, relax, and play. This week, we’re going to talk about places where we buy things. A shopping mall (or just “mall”) is a large building with many stores inside. 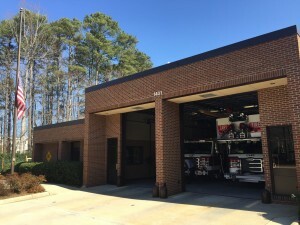 There are several malls in Wake County. 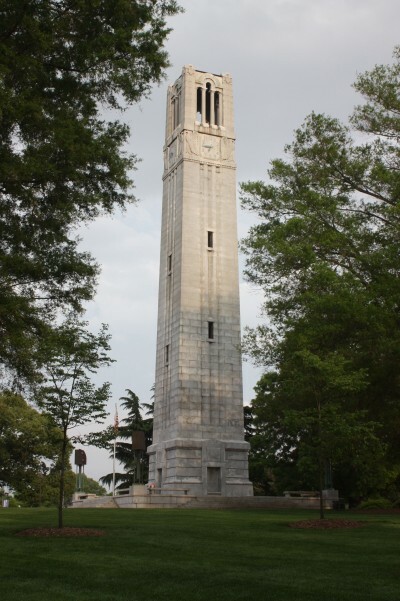 In Raleigh, you can go to Crabtree Valley Mall (in midtown) or Triangle Town Center (in north Raleigh). 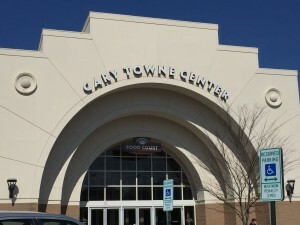 In Cary, you can go to Cary Towne Center. Malls usually have all kinds of stores as well as a food court (an area with many fast food restaurants and tables for eating). American malls usually do not include large stores like Target or Wal-Mart. They also do not usually have a grocery store. A shopping center is a very big area with many stores, but they are not all inside one building. 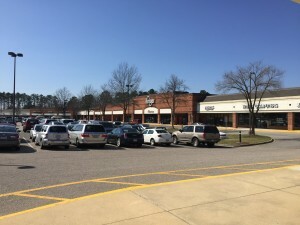 Shopping centers usually have more than one parking lot, and they often have “big-box stores” (stores that are shaped like very big boxes – Target, Wal-Mart, Best Buy, Toys ‘R Us, etc. ), which malls usually do not have. Many shopping centers also have a movie theater. 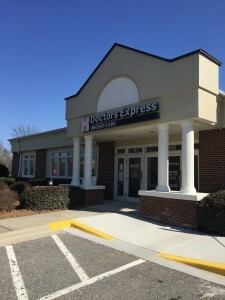 Crossroads Plaza in Cary, North Hills in Raleigh, Brier Creek Commons in Raleigh, and Park West Village in Morrisville are all shopping centers. A strip mall is a group of stores in a row (line, strip) with one large parking lot for all of them. A strip mall is similar to a shopping center, but it is much smaller. You can see strip malls EVERYWHERE in Wake County. There are hundreds of them. They often have a grocery store, a nail or hair salon, a small clothing store, a couple of restaurants, and several other small businesses. 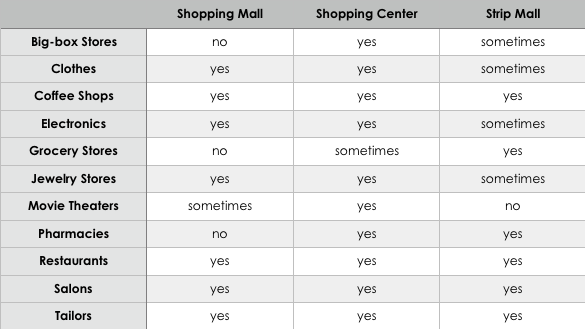 This chart shows you some of the things you can and cannot find in each type of shopping place. When the chart says “yes,” that means you can usually find that type of business there. When it says “no,” that means you probably cannot find that kind of business. Of course, anything is possible, but this chart gives general rules. The next time you visit a shopping mall, shopping center, or strip mall, look for the kinds of businesses on the chart. Did you find them? Was the chart correct? Welcome back to the Civics, Culture, and Community Blog! We didn’t write new posts during the winter break. Now it is January, and we will begin to write new posts again. Happy New Year!! How often will new posts be up? This year, you can read one new blog post every other week. That means there will be a new post one week, but not the next week (week 1, not week 2, week 3, not week 4). Posts should be on this website every Monday morning. If there is something specific you want to learn about but you can’t find it on this site, please post a comment or tell your teacher. We will write a topic for you or your class. 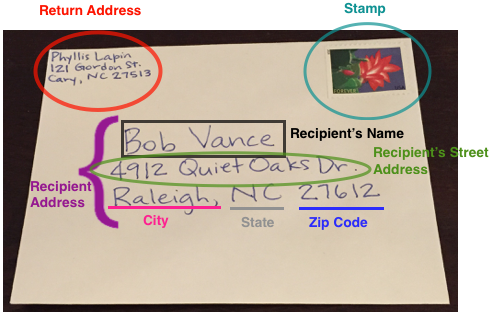 This blog is for YOU, our ESL students, and we want to write information that will help you. There are several options to use the blog. 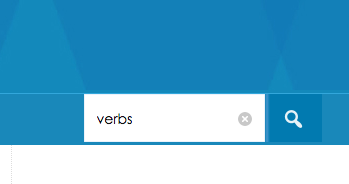 You can SEARCH for a specific topic by using the searchbox on the right. You can click on the links at the top. You can click on the links on the right. You can read the posts in order. What topics are on this blog? If you want to learn about something that isn’t here, please tell us! What are comments and links? You can comment on every post. Click this blue link to read how to comment. There are lots of links in blogs. Links are blue. They open a new window and go to a different webpage. You can always return to the original post. In the comment section or on paper, write YES or NO. If the sentence is wrong, re-write it correctly. You can learn about American history on the Civics, Culture, and Community blog. There is one new post every week. New posts are ready on Monday. 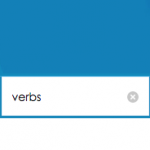 You can study grammar and vocabulary on the Civics, Culture, and Community blog. This blog is for teachers only. You can comment on any post. They did not withhold enough, and you must pay more. They withheld too much, and the government returns the extra money to you. This is called a refund. They withheld the right amount, and you break even (you don’t need to pay, and the government does not need to pay you). subtract other money you spent on things for your job, medical bills, education, charity, etc. It sounds complicated, but there are many computer programs that make doing your taxes easy. You can also pay a tax professional to do your taxes for you. You can also file your taxes online, pay your taxes online with a credit card, and get the government to put your refund directly into your bank account. Taxes are due on April 15. 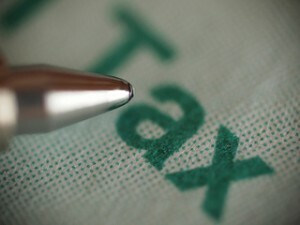 You can do your taxes early, but if you do them after April 15, you will have to pay a penalty. If you have not done your taxes yet, you only have a few more days. If you need help, there are places you can go for assistance. When you go, volunteers will help you prepare and file your taxes. 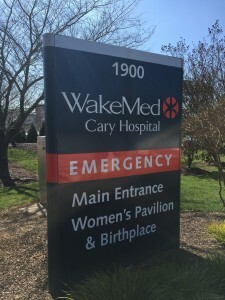 Click here for locations and information about what you need to take with you.